This is a blog about parenting a child/adult with special needs. We try to keep it focused on that topic. However, we are also a family. My husband is the proud father of four adult children and 12 grandchildren. Billy Ray and I are glad to have become a part of his family. When someone demeans Billy Ray, I have been called a Mother Bear and worse. The same emotion came out in Larry and I today when we watched a news report of Senator John Kerry's remarks: "You know, education, if you make the most of it, you study hard, you do your homework and you make an effort to be smart, you can do well. And if you don't, you get stuck in Iraq," (Copied from www.foxnews.com ). He was later to say he wouldn’t apologize for what was a botched joke and criticism of the President. We didn’t see it that way. We saw him attacking Michael. We could attack Kerry with our own angry comments, instead we choose to introduce you to Captain Michael R. Morgan, Intelligence Officer, US Army National Guard. Michael was in the U.S. Air Force for 4 years before marrying. After a divorce he remained the custodial parent of his four children and went back to college to further his education. Larry and I have often talked about his organizational skills at providing for their needs and care. Larry likes to tell of how he handled the morning routine like the military. He is a great Dad. Michael went to Iraq but he wasn’t stuck there because he failed to get an education and work hard. He has a degree in Environmental and Biological Sciences and a management position for the Corp. of Engineers. He went to Iraq and other international assignments out of duty. He left his children and his wife to do his duty. Michael and his wife have been there for us repeatedly. They were here when Billy Ray was on the ventilator with an uncertain future. Billy Ray loves all his stepsiblings but he knows Mike best because of their frequent visits and they have a special bond for which I will always be grateful. We see Michael as being there for our country the way he is there for his family. If you are the parents of a service man or woman in any country, you could probably share similar pride. It was obvious that Senator Kerry was referring to that joke of a President, who has never distinguished himself at anything. He was a failure a Yale. He was a miserable failure in business, which, I think, reflects how poorly he did at the Harvard Business School. He only went into politics because he failed so completely at business. The dead and broken bodies of our soldiers and marines in Iraq are the price we have paid for this failure's inability to make a living on his own. We should have seen the writing on the wall after Katrina and Rita. He can't do anything without messing it up, miserably. Obviously "anonymous" is the typical person who has these so very warped, ideas, not based on any facts, just "off the wall" blathering, with no intelligence involved. Just shows why he won't sign a name. Peggy, thanks for the support and nice words. I bet you would not find Mr Anonymous with a uniform on serving our country! Sorry for spelling errors, because didn't study to hard! Not only am I proud of my son Michael I am proud of every Amerian that stands up for our country and is willing to speak out in defense of it too. But I have to say I have always been proud of the wonderful man my son Michael turned out to be in life with his children, his family and his career choices. Don't mess with my son, or you'll find out what an upset mother can do! :-) The sad thing in this world is educated people can be ignorant too as Kerry has shown us over the years. As I've said often in the AOL chat rooms, my son is willing to fight for your rights to free speech but your ignorance is your fault not his. God Bless America and all of our children willing to defend it too. Love the proud mother of Michael. I was blessed in this life with four wonderful children. I'm sorry to hear that your offended by the comments made by the senator. You've highlighted a notable exception to the rule in the example you provided. 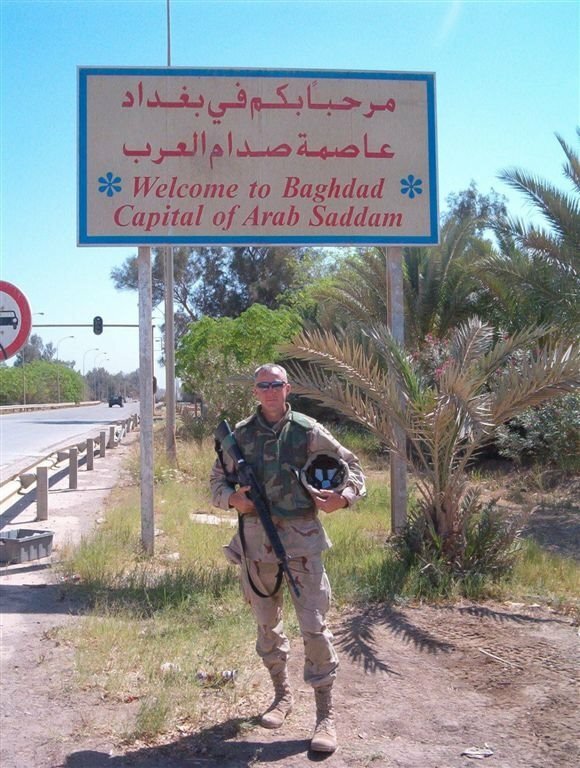 The US soldiers stationed in Iraq are fighting for nothing. It may hurt your feelings but the bottom line is that the men serving in Iraq are helping George Bush achieve his objectives and it has little to do with fighting for a just cause. I don't think there has ever been a president of the USA that has done as much long term damage to US interests as George Bush and his friends. Yes there will be some talented men of calibre who join the fighting forces however the fact remains most soldiers are poorly educated and joining the forces is often a last resort because they can do little else. You shouldn't take this as a personal attack. Farouq, freedom of speech is everyone's right here in the USA. And our soldiers defend that freedom. That being said they are doing the job they are told to do. They are willing to defend the USA no matter where they are sent. Standing up for our son's and daughter's I believe was the beginning of this blog. Whether you agree or disagee isn't the subject here. It's standing up for our children. The children I'm sure every parent is proud of for their children no matter where they are or no matter the country. That's one of the wonderful thing the USA stands for is the freedom of choice no matter what your choice is and the right to freedom of speech too. Everyone has a right to their opinions but our son's are just willing to fight for everyone's rights to their freedom. No matter what your opinion I will always be proud of my son willingness to defend our country's choices. I beg to differ, most of our soldiers did not join because of poor education, they joined because they wanted to defend our country and believe in our values as United States Citizens! My husband is in the Australian Navy. We have four children 2 boys and 2 girls. Our oldest son has been diagnosed with aspergers syndrome and they are now investigating our younger son for the same. It is hard enough when my husband (and other service poeple) go away let alone having stupid jerks (anyone in power) saying they are dumb. People like that need to be slapped.